The most aggressive LC HD Pad, designed to remove heavy scratches, swirls, and defects. 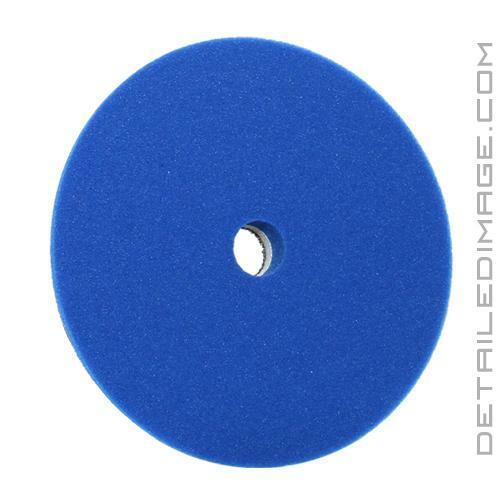 The Lake Country HDO Blue Cutting Pad will help you remove heavy imperfections with ease! Pair it with your favorite compound or polish and remove medium to heavy imperfections safely and easily. The HDO line of pads are perfectly balanced, cushioned, and feature thinner foam. This thinner foam reduces foam movement which will reduce heat (10% cooler) which can cause hazing and micro-marring while polishing. These pads are beveled at a 70 degree angle and this design prevents pad "rolling", allowing the pad to stay flat on the surface. The open cell cooling chamber in the center of the pad is another great feature of this pad as it helps keep the pad running at cooler temps, increasing durability and polishing results. The backing of these pads will also withstand the large throw of the Rupes, Griot's Boss and other high powered large throw machines. This pad comes in three great sizes and the 3.5" pads are perfect for 3" backing plates, 5.5" pads fit on 5" backing plates and the 6.5" pads fit great on 6" backing plates. Pair this Blue pad with your favorite compound to remove medium to heavy imperfections fast and easy! HDO is an awesome line of pads from Lake Country. I use this pad for moderate to heavy defects with a quality compound and have yet to be disappointed with the results I get. I personally like to dampen the pad a little before use and tend to get better results out of this pad that way. The cutting pad! Pros - cuts with ease top knotch. Cons - price but well worth it. Will but again and again. I used to use a 3.5%u201D orange pad or a wool pad to clean the headlights. This blue one blows away all of the other pads. I used it to take off water spots as well. I had to buy a second pad just in case I lost my first one. This small pad does big jobs.